Indoor Plant Décor Goes Live! 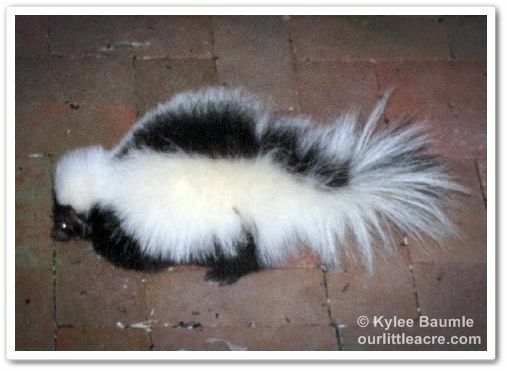 Skunks are plentiful around here. Especially in spring. You know the old saying, "It must be spring - there are dead skunks on the road." We see them year round, almost always at night, which makes sense, since they're nocturnal creatures. I fear that our cats will meet the smelly end of one of them someday, but when a skunk comes around in search of cat food, our smart cats give it a wide berth. This spring, as I've walked around Max's Garden, looking for newly emerging plants, I've smelled what I was certain had to be skunk musk. And then, of course, my first thought was, "Oh no, I hope one of the cats didn't get too close." But when I checked the cats later, they were all fine. 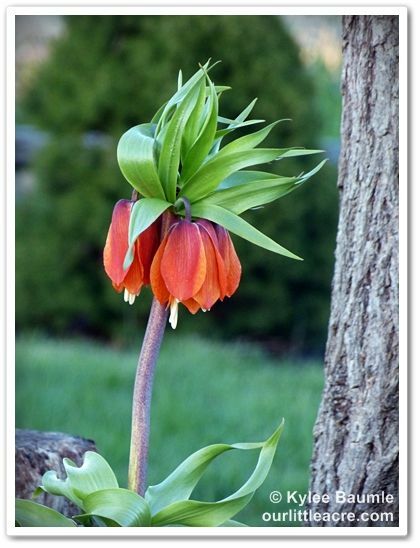 Fritillaria imperialis is known for its skunky smell. When I planted the gigantic bulbs in the fall of 2011, they were quite "fragrant" and I understood why scavengers leave them alone when digging for a snack in the garden. But I never thought the plant itself would smell like that. 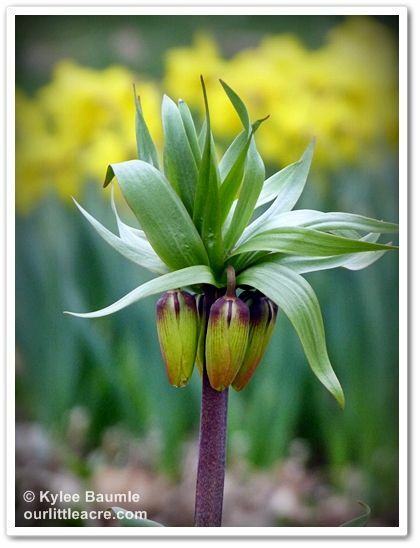 Usually, a plant only has an odor that's detectable from a distance if it's in bloom. But not this one! From the time it first emerged from the ground, you could smell it. Now I'm a super sniffer, so maybe I can smell it before most people would, but it's pretty strong. I didn't notice the odor last year when they emerged but none of the three plants bloomed last year either. Even though they were smelly before they bloomed this year, maybe they have to reach a certain age before they emit a strong odor. You know...like teenage boys. In any case, I'm elated that this year, two of the three plants are blooming!! One seems to be stunted but has blooms, one isn't going to bloom, and the third one is just perfectly gorgeous. 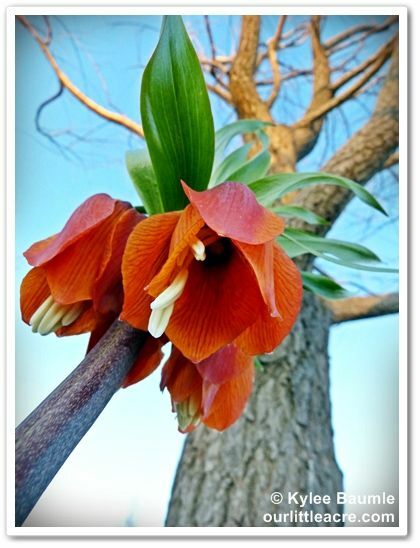 Crown imperials can be tricky to grow. They prefer soil on the neutral to alkaline side (what we have) and it's imperative that they have good drainage. When I planted them, I made a little mound and I used mostly sand to fill the hole around and on top of the bulb. They don't like to be moved, but we're going to have to move them later this year because they're beside a weeping willow tree that died and we have to take that out. We'll do that later in the fall and I'll replant them. I wouldn't be surprised if moving them causes them to not bloom next year. 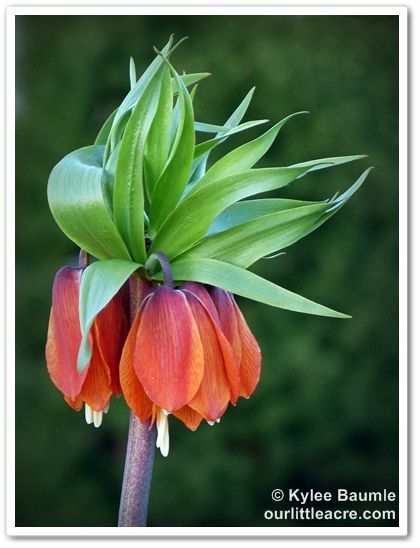 Fritillaria imperialis are hardy bulbs in Zones 5-8 (some sites say 4-9) and can benefit from extra winter mulching in the colder zones. (I didn't.) 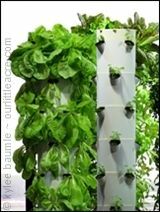 Although the tallest of my plants is a little over two feet tall, they can grow to a height of as much as five feet. They are one of the more pricey bulbs. I bought them in the fall on sale at $7.99 each. Worth every penny when I see their "bad hair day" colorful blooms...in spite of their not-so-sweet smell. 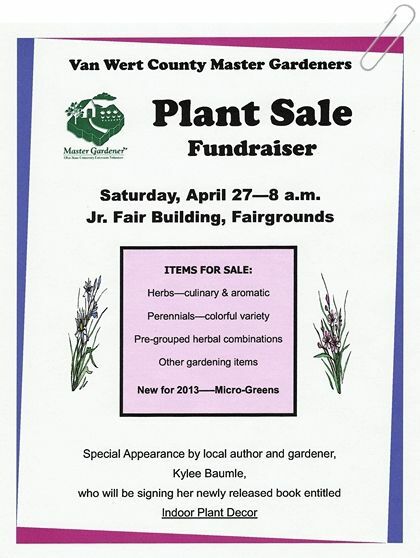 This Saturday, the Van Wert Master Gardeners will be having their annual plant sale. 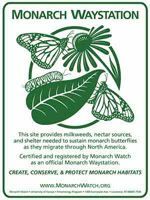 This is a fundraiser for the group, because they are not funded by any entity other than donations and fundraisers such as this and their garden tour later in the summer. 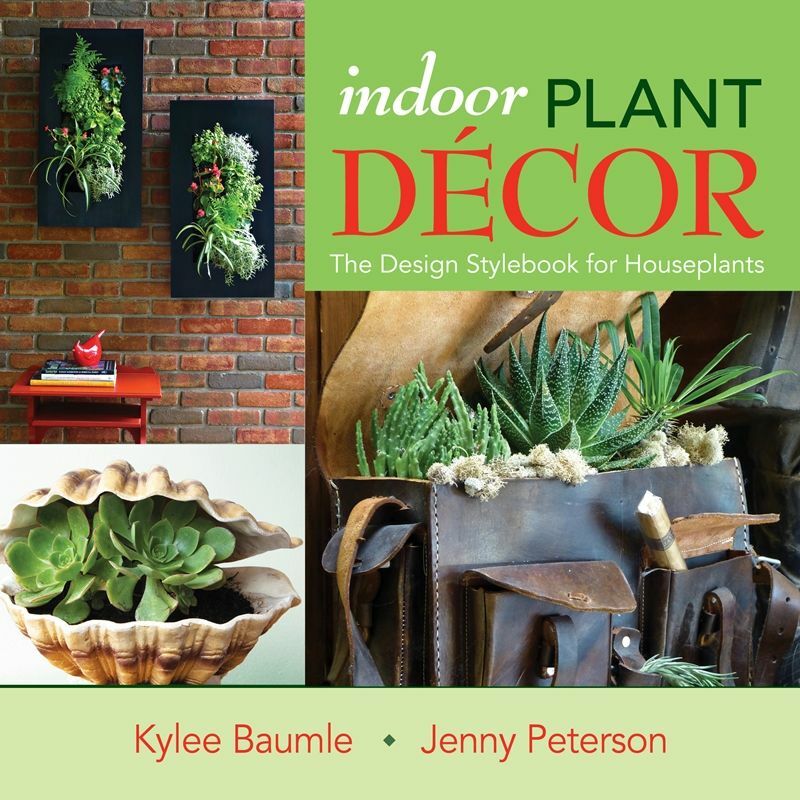 I will also be on hand to sign copies of my new book, Indoor Plant Décor: The Design Stylebook for Houseplants. This will be my first official book signing event! I'll be bringing a decorative planter with me, and each person who buys a book that day will get to put their name in a drawing to win it. You must be present to win. The sale will be held in the Junior Fair Building at the Van Wert County Fairgrounds, 1055 S. Washington St. (click link for map), and starts at 8:00 a.m. The sale will run until all plants are sold. 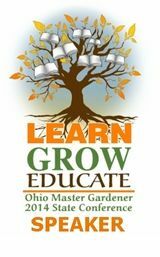 Come and help out the Master Gardeners of Van Wert County! Mama could have met with an ill fate while she was away from the nest. 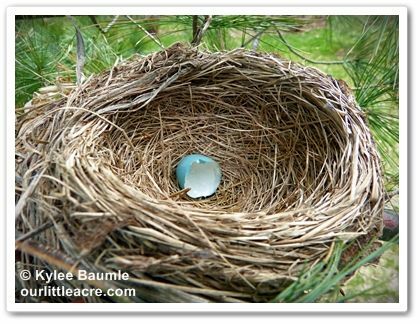 Mama may have returned to the nest during the time when the eggs were on the ground and seeing none, abandoned it. 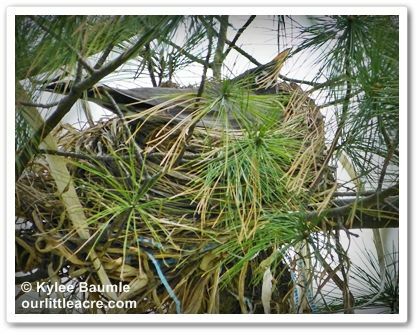 A predator could have invaded the nest and destroyed the eggs before Mama could get to them. 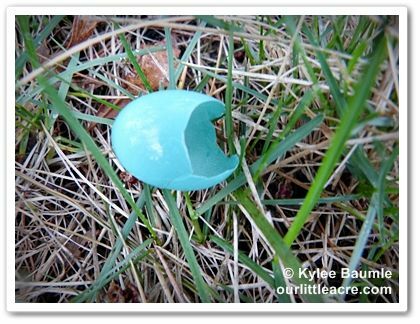 We'll never know for sure, but when I went out to check on them yesterday, another broken egg was on the ground, along with an intact one. The broken one still contained the yolk, with no signs of development. There was also a broken one in the nest, which made me think a predator had gotten to them. 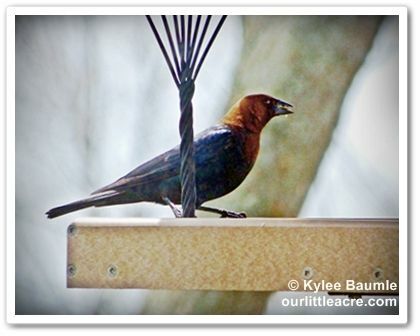 The most likely culprit is the brown-headed cowbird that we've seen at a nearby feeder. This bird is known for taking over the nests of other birds and will destroy eggs. Sad, but also a part of everyday life out in the wild. Weekend Wisdom: Or Should That Be Weekend "Whizdom?" As nice as some people can be - and humble, too - in reality we're a self-centered lot. Well, except for when we think we're the only one in the world who does this or thinks that, but even that is a bit egotistical at times. We all like to think we're normal, but as Erma Bombeck says, "Normal is just a setting on the dryer." Making our way through life, we have experiences that seem normal to us, in that we think everyone does things the way we do. I mean, we've always done it that way or we've always been that way, so it must be the same for everyone else, right? Not necessarily. When I was in college, studying dental hygiene, I learned about the protruberance (something that sticks out) that I'd had in the roof of my mouth for as long as I could remember. In fact, I never really gave it much thought until then. It seems that not everyone has this, even though I assumed they did. I learned it's called a maxillary torus (although technically mine is a mid-sagittal protruberance because of its shape) and it's simply extra bone. No one really knows why some people have them and some people don't, but there is a hereditary factor. I also have tori on my lower jaw (called mandibular tori), on both the tongue side and cheek side, as well as on the cheek side of my upper jaw. There's nothing to be done about it and it's not harmful, unless I ever find the need to get dentures (please NO). It creates a problem whenever I have to have impressions taken because the impression trays are not made to accommodate that extra bone. (Can't someone invent a flexible tray???) It also is a problem when I'm eating certain things like taco chips or very firm apples, because as I bite down, these things can scrape the tissue covering the bone and it gets sore. About 7-10% of the U.S. population has mandibular tori. It's more common in the Asian and Inuit population, and it can continue to form as a person ages, apparently stimulated by bruxism (grinding your teeth). What does this say about me? That I'm highly stressed?? Well, anyway, it turns out that I'm "special" in yet another way. We're going to get very personal here. I've known for a long time that whenever I eat a lot of red beets that I'm going to have a "phenomenal" bathroom experience. Plainly put, it turns my pee pink. Sometimes I forget and for a moment I wonder if I've got a bladder or kidney infection. Then I remember the beets. I've talked to other family members and I was skeptical when they said they'd never had that happen to them, because gee...this was normal, right? I mean, it happens to me just about every time I eat them. I was sure they just weren't taking notice of their own pee. Turns out that only one in eight people experience what's called "beeturia." It's caused in certain humans by oxalic acid in the digestive system not allowing the betalaine in the beets to be absorbed, so it's excreted. 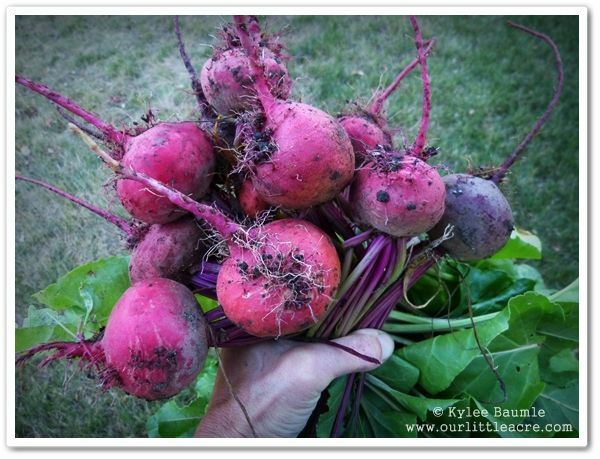 Furthermore, they found that people that ate pickled beets experienced beeturia more often than those who ate boiled beets, due to the acidic nature of vinegar in the pickled beets. Studies in the 1950s concluded that there was a genetic factor associated with beeturia, but later studies disproved this. So now you know more about me than you ever wanted to and maybe yourself. If there's anything normal about any of us, it's that we're all unique. *Thanks to Chris Tidrick for the "whizdom" pun. The very best thing about spring isn't the warmer weather, although it ranks right up there near the top. For me, it's the day after day appearance of new life in all forms. 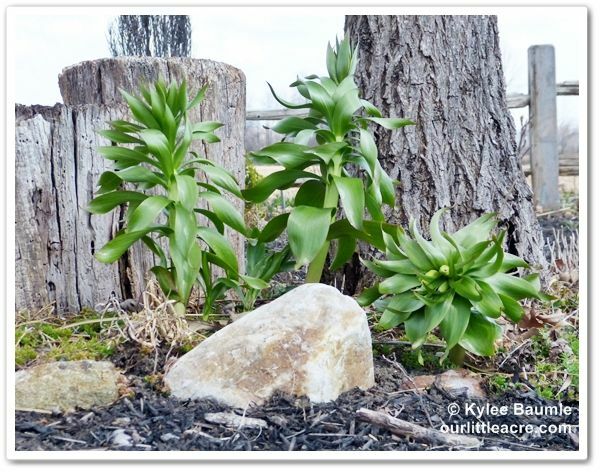 As a gardener, of course I love to see each new plant come to life and bring color and vibrance to the landscape. But I also look forward to birds returning from their winter homes to take up residence here around ours. The bluebirds were spotted earlier this week, checking out two of the three bluebird houses we have out back. A couple of days ago, we heard the most beautiful symphony as we stood in the backyard. 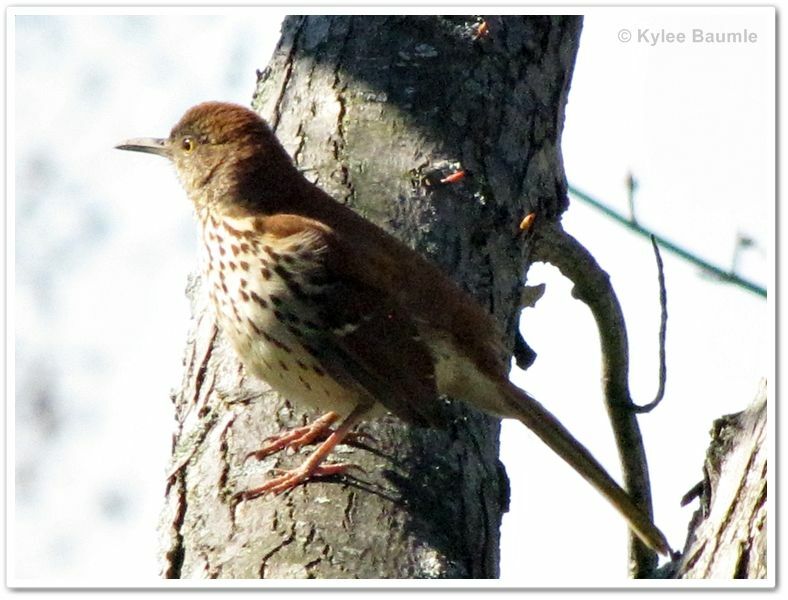 Looking high up into one of the larger trees, we saw a brown thrasher. They have a multitude of melodies they sing, much like a mockingbird has. In fact, they are known to have the largest repertoire of songs of all birds, with over 1000 in number. 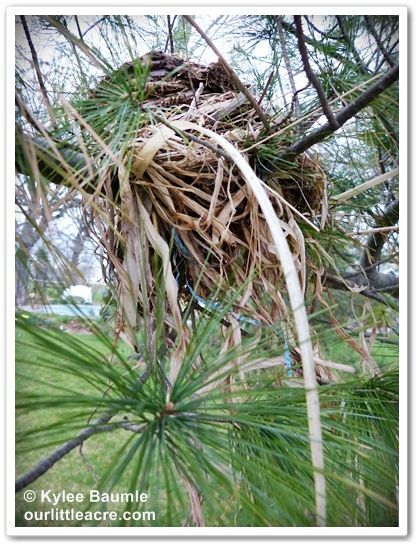 That same day, as we walked around the yard, enjoying the 80+ degree weather, I noticed a long piece of dry, dead Miscanthus grass hanging from a low branch of the Maine pine tree. 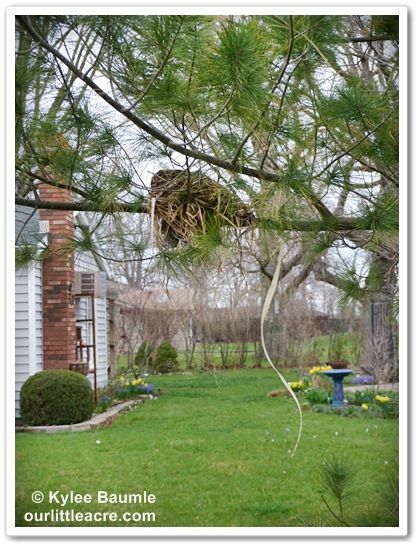 The last time I saw something hanging from that tree (a little higher up), it was attached to a nest. So it was this time, too. 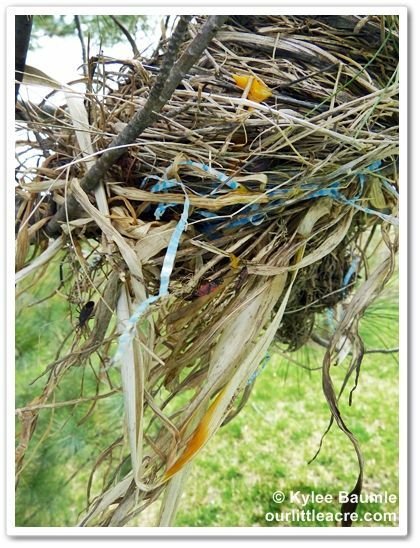 This was a well-made nest, dense and melded at the top with mud. 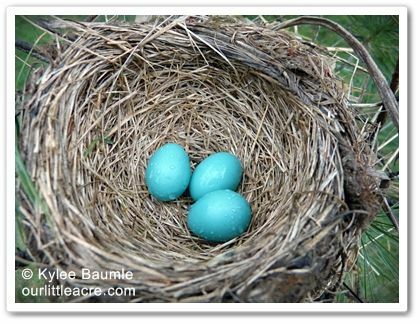 The color of blue was more of a light teal than a robin's egg blue, but the nest, coupled with the size of the eggs, let me know that it belonged to a robin. Why on earth it picked the west side of the tree instead of the leeward side, or the low branch (about five feet off the ground and within leaping distance of the cats), when there were so many more protected locations in that very tree, is beyond me. Spring is very windy here and that branch was bouncing. Eventually, the mother robin was seen in the nest and I didn't worry about her or that the nest might be dislodged from the tree. She'd done a very good job of building and securing it. But she left the nest unattended quite often. A severe storm was due to come in and I feared for those eggs. 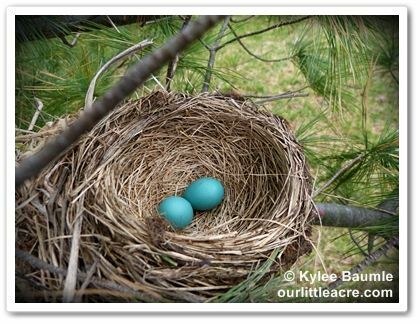 The next day, as we were walking around the yard with Hannah, we checked on the nest and the eggs. As I pulled the branch down a bit to peek in, there were no eggs. A look on the ground revealed four of them. Though I read that a robin will only lay one egg a day, she definitely laid two between that day and the afternoon before. We carefully placed them back in the nest - all but one, which hadn't survived the fall from the nest. It's a myth that a bird will abandon eggs or baby birds that have been touched by humans, but we avoided touching any more of the surface of the eggs than necessary when replacing them. Time will tell if the eggs survive and then the chicks. It's not an ideal situation, but we'll keep an eye on them and continue to help them if necessary. Today is the day. The major project that co-writer and friend Jenny Peterson and I undertook last May is out there in the world. 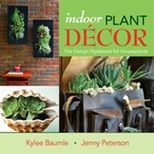 Indoor Plant Décor is available on Amazon and Barnes & Noble. When we began our quest to write a book together, we knew very little about the process. 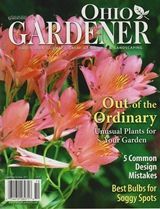 We talked with a couple of publishers who wanted us to write, but they both wanted us to write about something different. But we had a goal in mind and we were elated when Paul Kelly, owner of St. Lynn's Press said yes. After a lot of phone time and much discussion on the direction our book would take before he even offered us a contract, last May we signed on to do it. At the exact same time we began writing our book, Jenny discovered she had breast cancer. There was a lot of contemplation about what to do - should we put off writing the book or should we go ahead with it? What was best for everyone? I wanted to do what was best for Jenny, and Paul was supportive of whatever we decided, so when Jenny determined that she could - she would - do this, it was on. That doesn't mean it was easy. We both had some physical issues that not only occurred at the same time, but they came at a crucial time in the book writing process. Add a week without power and shuffling from one offspring's home to another to stay cool in the 100-degree heat of July while trying to secure and upload photos to meet a deadline and things got a little scrappy there for a bit. But with that part over with, and the rest of the book before us, it was Jenny that had to persevere through chemo and radiation, all the way up to the end of December, when we were submitting our final material. I'm here to tell you right now, I'm pretty sure I could not have done what she did, let alone do it as well as she did it. To say she was inspirational leaves a lot unsaid. I saw the scars. I was there during some of the tearful times - the ones that she wanted the world to know happened, but didn't particularly want them to see. She didn't want people to think she was Wonder Woman, but she didn't think they necessarily wanted to see the not-so-nice part of it all either. In the end, what we all saw was a beautiful soul who handled what life dealt her with grace. Today Jenny is cancer-free and one of my closest friends. 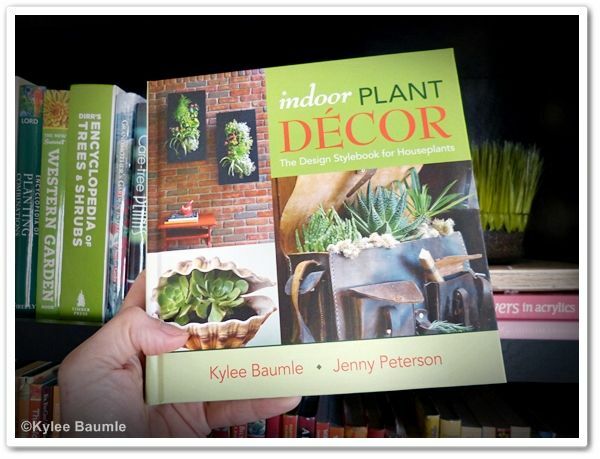 When I first took a look at the finished Indoor Plant Décor, I saw a nice-enough looking book. I'm uncomfortable saying I'm proud of anything I've done, but I am proud of it, and not for the reasons you might think. When I look through its pages, see the photos, and read the words, I see all the months of phone calls, personal visits, the shared laughter, anguish, and yes, tears. 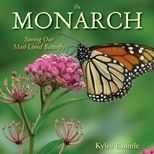 I see two friends who now share this special kind of bond, represented to the world as a book about houseplants, but that will always be so much more to the two authors who wrote it. 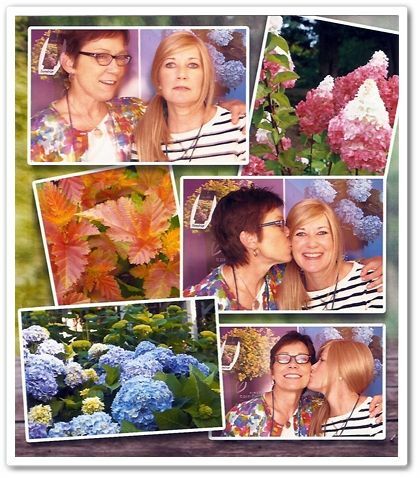 while attending the Garden Writers Association annual meeting in October 2012. Weekend Wisdom: Does Lightning Make the Grass Greener? You may have heard it said that following a thunderstorm, which by literal definition contains lightning, the grass will be greener. It's not the rain, mind you, but the lightning that has been credited with greening up the grass. Is it true? I trust scientists that know a whole lot more about this stuff than I do, but I have to say I'm a believer, no matter what they tell me. I've seen it. Simple rain has failed to green it up to the extent that I've seen a good thunderstorm with an abundance of lightning do. 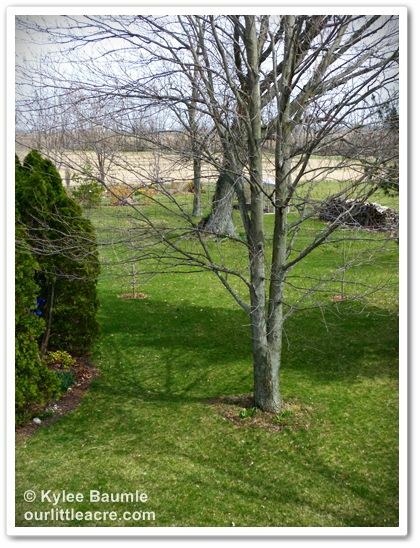 Nitrogen in fertilizers is responsible for greening up the grass. The atmosphere contains 78% nitrogen, but in order for plants to make use of it, the nitrogen bonds have to be broken so they can combine with oxygen to form nitrates, the form of nitrogen that plants can use to form more chlorophyll. 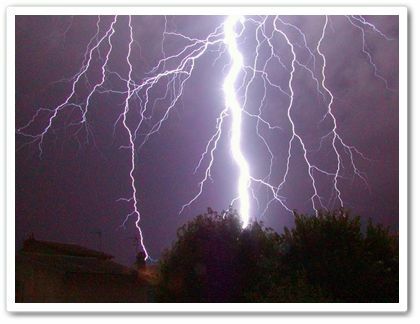 The lightning provides enough energy to do this, causing the nitrogen to combine with oxygen in the air, which is then taken to the grass in the raindrops. The grass drinks it up and is greener. The debate over this is whether there are enough nitrates formed during a storm to make a difference. Those of us who have seen it happen are convinced there are. Others will disagree and you can find just as many opinions on one side of the issue as the other. As a dental hygiene student in college, I was taught that a teething baby's diaper rash has nothing whatsoever to do with the teething. I believed that too, until I had my own kids and saw it happen. 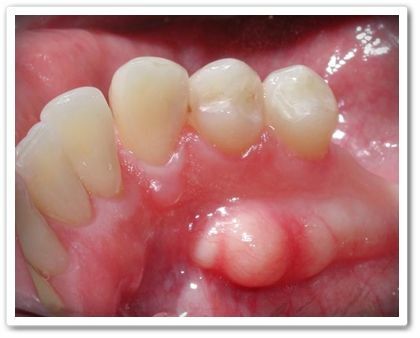 Over and over, that rash would appear at exactly the time a new tooth did. So what about that? I'm rather surprised at the number of people I encounter that have never heard of this lightning/green grass thing. It's something I remember hearing many times from an early age. That, of course, doesn't make it correct, but years of personal experience have helped to form my own opinion on the issue. This spring, we've had rain and we've had warm temperatures, but it was only after a thunderstorm with plenty of lightning one night this past week did I notice the extreme green that lay before me the next morning when I looked out the window. The difference was dramatic enough for me to think about this lightning connection again. You may say I'm wrong, but that's okay. We'll just agree to disagree.